Tahini (or tahina) is a thick oily paste made from toasted and ground sesame seeds. Occasionally, the paste can be made from raw organic sesame seeds. The paste is used in North African, Armenian, Greek, Israeli, Cypriot, Iranian, Turkish, Iraqi, and Levantine cuisines. To make Tahini, sesame seeds are soaked in water, then crushed to separate the bran from the endosperm. The crushed seeds are soaked in salt water, causing the bran to sink. The floating seeds are skimmed off the surface, toasted, and ground to produce an oily paste. Because of tahini’s high oil content, many manufacturers recommend refrigeration to prevent spoilage. Some manufacturers also recommend storing in a cool, dry place. Most raw organic tahini do not have preservatives or stabilizers and should be kept in a tightly closed container in the refrigerator. It will keep for up to 3 months. Tahini is flavourful and adaptable, and makes an ideal base to sauces that accompany vegetable or pulse-based dishes. 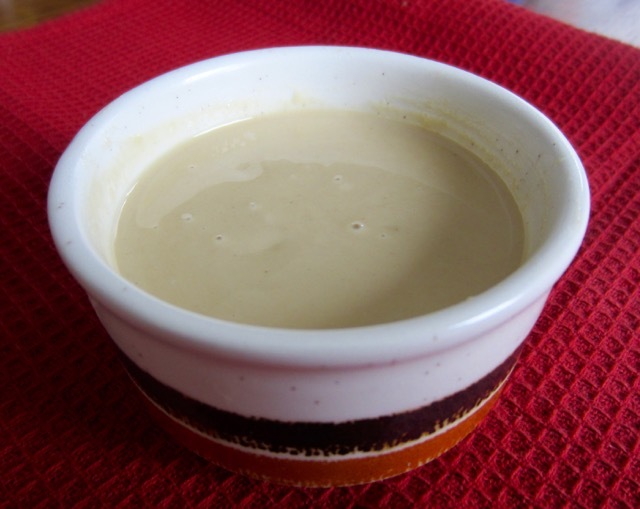 Tahini can be served as a dip or sauce, on its own. Used with grilled aubergine to make baba ghanoush. Wow thanks for the tip. I never though I could add sweet ingredient to tahini but of course we usually add jelly to peanut butter…have a great week! oh what a great idea. I will try that next time. Thanks, Anna! I baked some fresh bread today. I shall try that for breakfast tomorrow. Thanks, Anna. Enjoy the week!